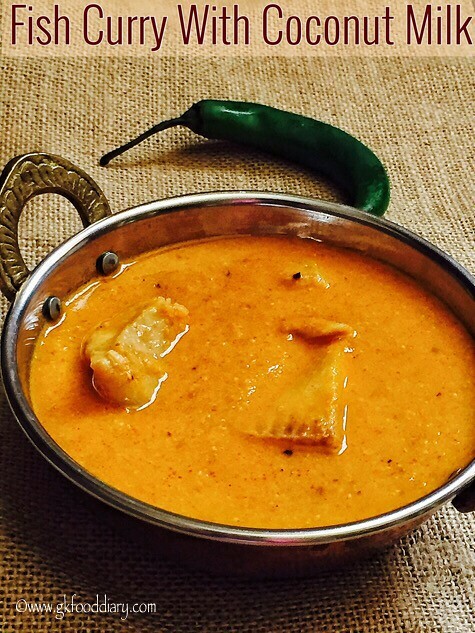 Fish Curry with coconut milk – mildly spiced fish curry with coconut milk apt for babies, toddlers and kids. I have already posted two versions of fish curry with coconut and without coconut. Both the version of curries are little spiced, better suited for older kids and adults. This version of fish curry with coconut milk is my recent try which is very easy to make with in 30 minutes and got this recipe from my neighbor. She cooks authentic Kerala dishes well and all her recipes are tastes great:) This fish curry too turned out awesome and I never know making tasty fish curry is this much easier. This fish curry can be given to babies after 10 months or one year after introducing fish separate. Read here on how to introduce and select fish for babies here. This curry goes well with plain rice, Idli or Dosa. Now let’s get on to check how to make fish curry for babies, toddlers and kids with coconut milk. 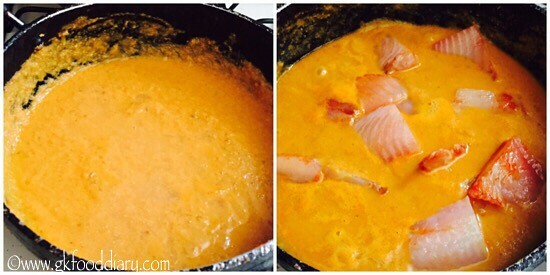 Fish curry - mildly spiced fish curry for babies, toddlers and kids with coconut milk. Keep all the ingredients ready. Peel onions & garlic. Chop the ginger & tomatoes roughly and slit the chillies. Heat a tsp of oil and add cumin seeds, coriander seeds. Roast them for a minute. Then add green chilli, ginger and garlic. Saute them until garlic turns slightly brown. Then add onions and fry them nicely until transparent. Then add tomatoes in and fry it till turns mushy. 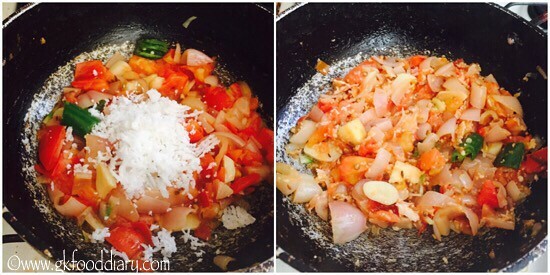 Now add grated coconut if using and mix well. Switch off the flame once done and cool it down. Then grind with little water to make a fine paste. Set this aside.Wash the fish pieces well and marinate with turmeric powder and salt for at least 10 minutes. 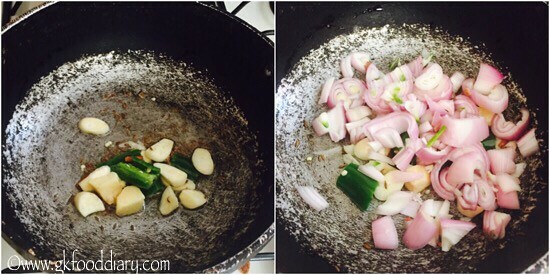 Heat a kadai with oil and add the items to temper. saute for a minute. Then add the ground paste and mix well. Now add the red chilli powder along with salt. Mix everything for a minute. Adjust with water if needed. Boil the curry in medium flame 5 minutes. Then add the marinated fish pieces in and cook it for 5 more minutes. Then add coconut milk and cook it further until the curry becomes thick. Switch off the flame once the fish pieces are cooked well and everything comes together. 1. Keep all the ingredients ready. Peel onions & garlic. Chop the ginger & tomatoes roughly and slit the chillies. 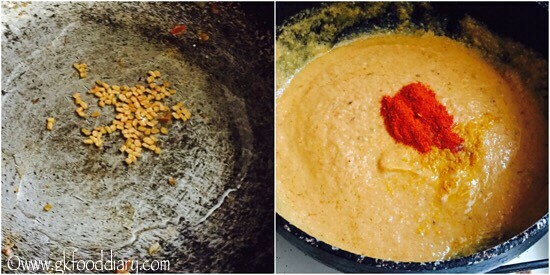 Heat a tsp of oil and add cumin seeds, coriander seeds. Roast them for a minute. Then add green chilli, ginger and garlic. Saute them until garlic turns slightly brown. Then add onions and fry them nicely until transparent. 2. Then add tomatoes in and fry it till turns mushy. Now add grated coconut if using and mix well. Switch off the flame once done and cool it down. 3. Then grind with little water to make a fine paste. Set this aside.Wash the fish pieces well and marinate with turmeric powder and salt for at least 10 minutes. 4. Heat a kadai with oil and add the items to temper. saute for a minute. Then add the ground paste and mix well. Now add the red chilli powder along with salt. 5. Mix everything for a minute. Adjust with water if needed. Boil the curry in medium flame 5 minutes. Then add the marinated fish pieces in and cook it for 5 more minutes. 6. 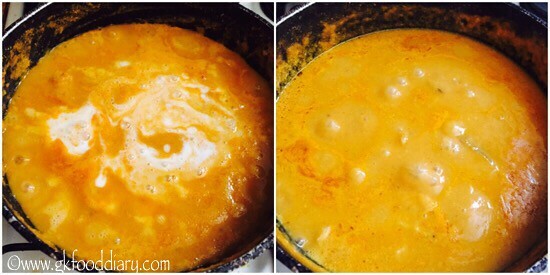 Then add coconut milk and cook it further until the curry becomes thick. Switch off the flame once the fish pieces are cooked well and everything comes together. 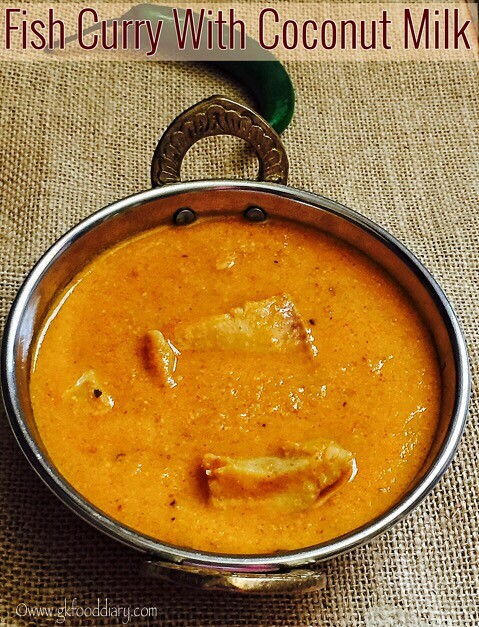 Fish curry with coconut milk is ready. You could also use 1 tbsp of tamarind if you want sour taste. 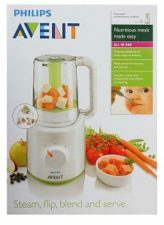 For small babies avoid tamarind and choose tomatoes with slight sourness. 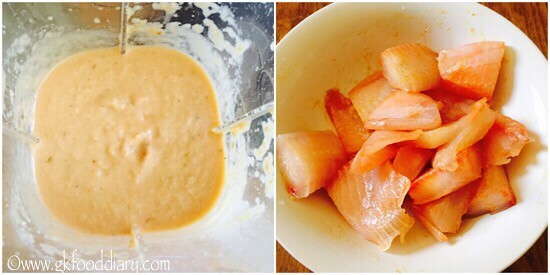 Make sure your baby is not allergic to any of the ingredients mentioned, before you try this fish curry. 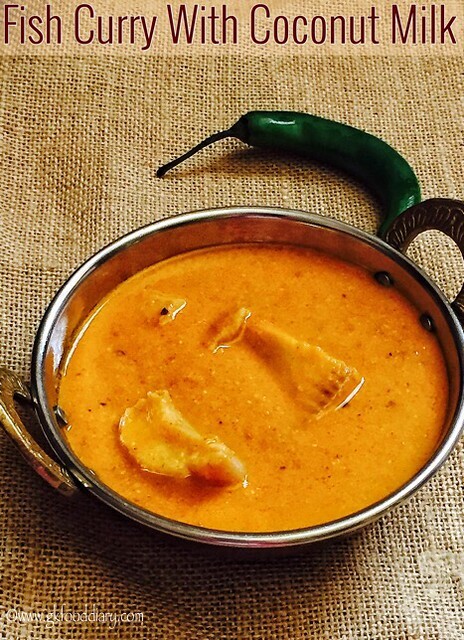 You can use any variety of white fleshed fish which is apt for gravy to make this curry. Salt is very important for the perfect fish gravy. So add it accordingly. Resting time is very important. Give at least half an hour resting time before serving.